The 2018 Apple Blossom Royal Court (from left to right): Princess Jessica Murray, Queen Gretta Wiersma, and Princess Sophie Castillo. Snow was falling steadily in Olympia when the 2018 Apple Blossom Royal Court arrived Tuesday morning. 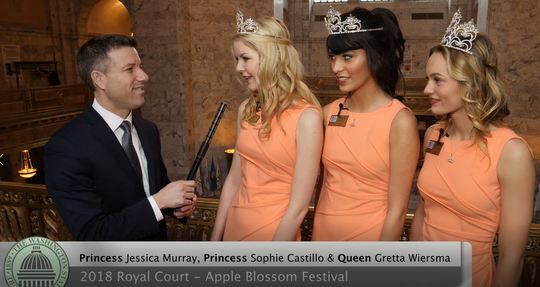 Many visitors were bundled up in dark winter clothing, so the sight of our Apple Blossom Royalty in shiny crowns and peach-colored spring dresses made for a real contrast. It also was a nice reminder that spring is only a month away, and this year’s legislative session should end in time for my family to enjoy our 99th annual festival, April 26th – May 6th. 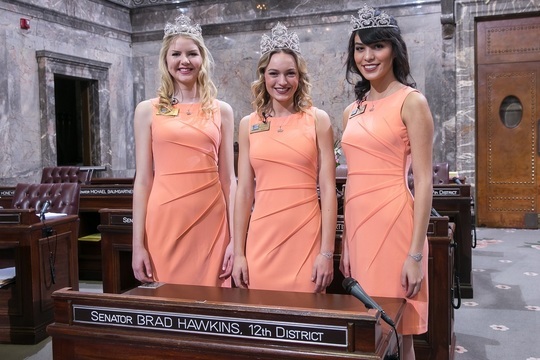 The Senate was in session Saturday morning, February 10 – the day of this year’s royalty selection pageant. But, as I explained to Queen Gretta Wiersma, Princess Sophie Castillo, and Princess Jessica Murray when welcoming them here, the Senate completed its voting just in time for me to make the drive home and attend the evening pageant. 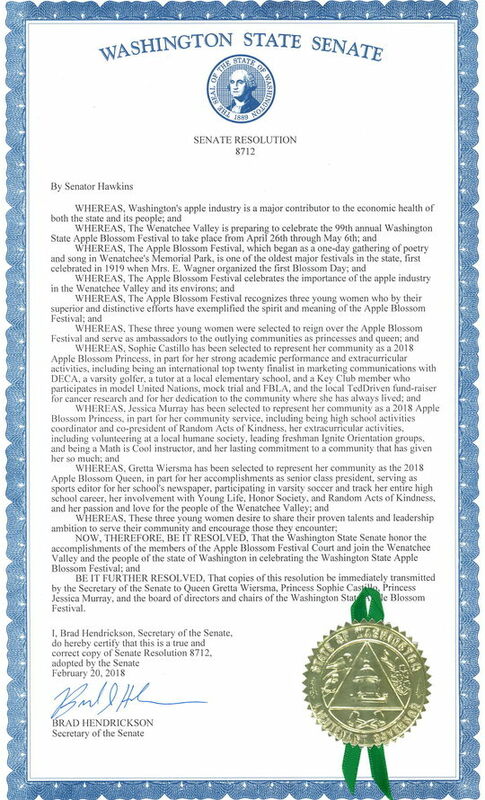 I always enjoy “Apple Blossom Day” at the Capitol because of the opportunity to host our festival ambassadors and help promote the Wenatchee Valley. The queen and princesses continued their Capitol visit tradition by meeting our 12th District Representatives Mike Steele and Cary Condotta, Secretary of State Kim Wyman, and Governor Jay Inslee. I also had the opportunity to introduce our Apple Blossom ambassadors to many of my legislative colleagues. I enjoyed interviewing the queen and princesses in the Capitol Rotunda about their visit to the Capitol and the Apple Blossom Festival. Once again, the Royal Court’s visit to Olympia included the debut of their “royalty song” about the festival. Click here to enjoy the video of the interview and the song. Between their visit with Governor Inslee and return to the Senate chamber for the adoption of my Senate resolution honoring the festival, I introduced the queen and princesses to Secretary of State Wyman. As it turned out, all three young ladies are voting age – so I had arranged for our state’s chief elections officer to personally register them to vote. It was one of the highlights of my day to see how intelligent and talented these three ladies are and to now know they will be participating in our election process. Although it has been less than two weeks since the selection pageant, our royalty were fabulous ambassadors for the festival during their busy day in Olympia. My official Senate resolution is below. I encourage everyone to participate in and enjoy this year’s festival. As for the legislative session, we continue to be active approving bills and considering the recently released budget proposals. My schedule has been so busy in Olympia that I have not had as much opportunity as I would like to respond personally to my correspondence. While I’m a bit behind schedule in that regard, we can catch up in person, if you’d like. You’re invited to visit with me informally this Saturday, February 24 from 11:00 a.m. – noon inside Pybus Public Market.